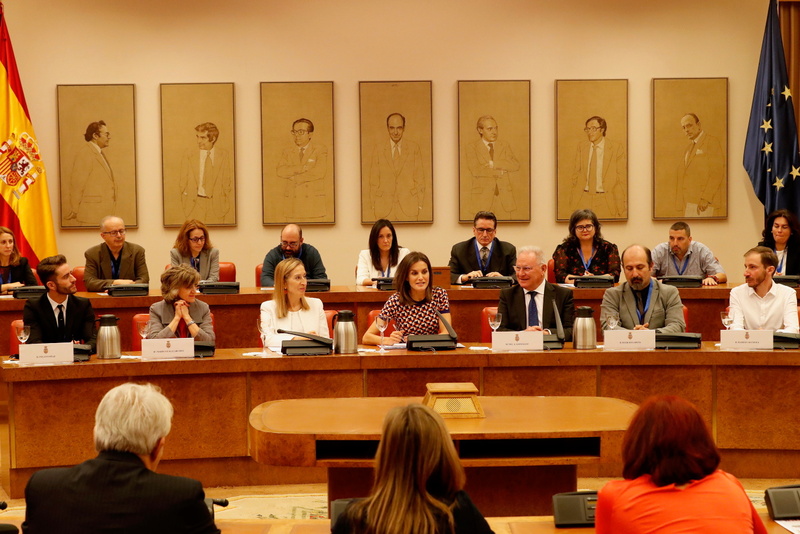 Queen Letizia of Spain attended an event on the occasion of World Mental Health Day 2018 in the Congress of Deputies held by the Spanish Mental Health Confederation. 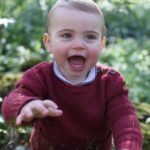 The theme of this years day was “Inclusive Education, Positive Mental Health”. 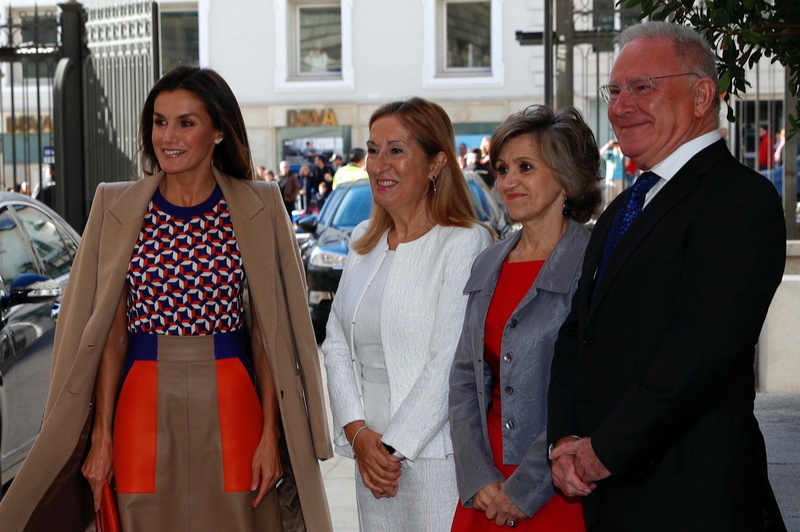 Upon arrival Queen was received by the President of the Congress and Health Minister. 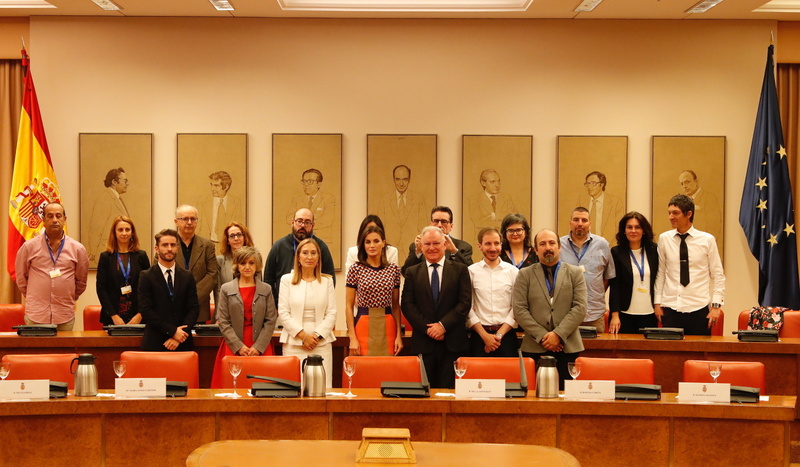 Spanish Mental Health Confederation is a non-profit organization established in 1983 working with a mission to improve the quality of life of people suffering from mental disorders and their families. 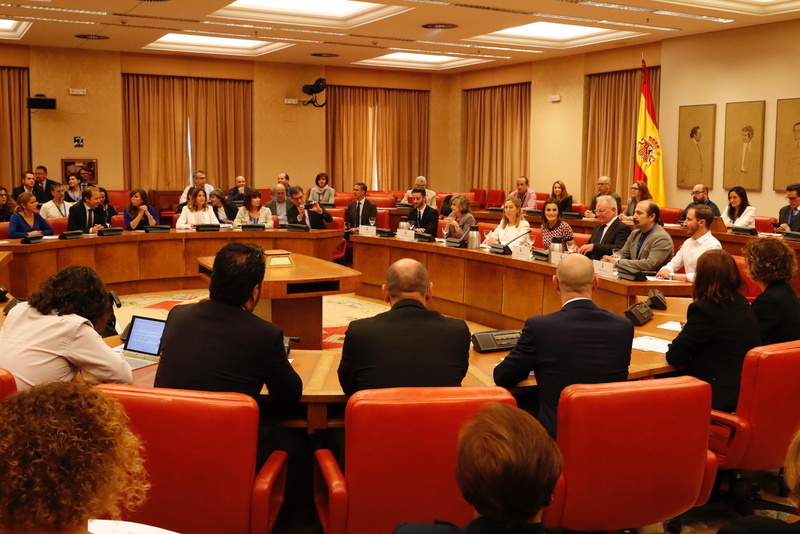 Th event began, after a tour of the congress building, in the Constitutional chamber of the building, where Letizia took her place at Presidential table. A social media influencer, Pelayo Diaz, presented key attributes and approaches to join the youth into the mental health discussion. 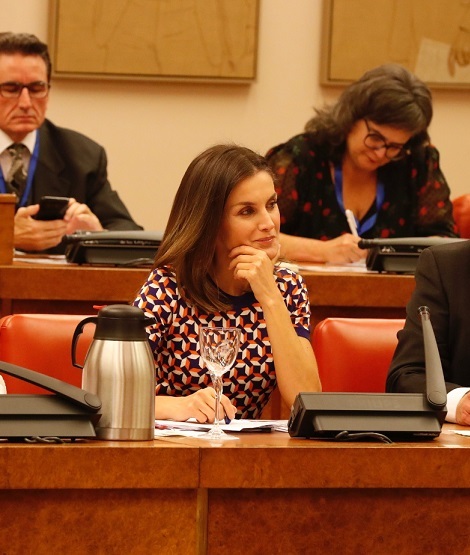 Speaking at the event, Letizia remarked, ” No one should feel guilty of suffering a psychic malaise and there are ways of recovering. 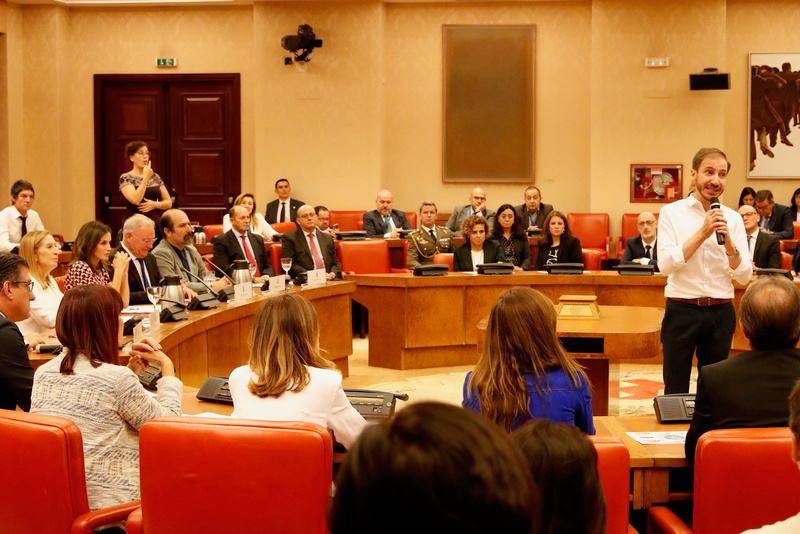 Our efforts and commitment to the mission will be a success one day” . 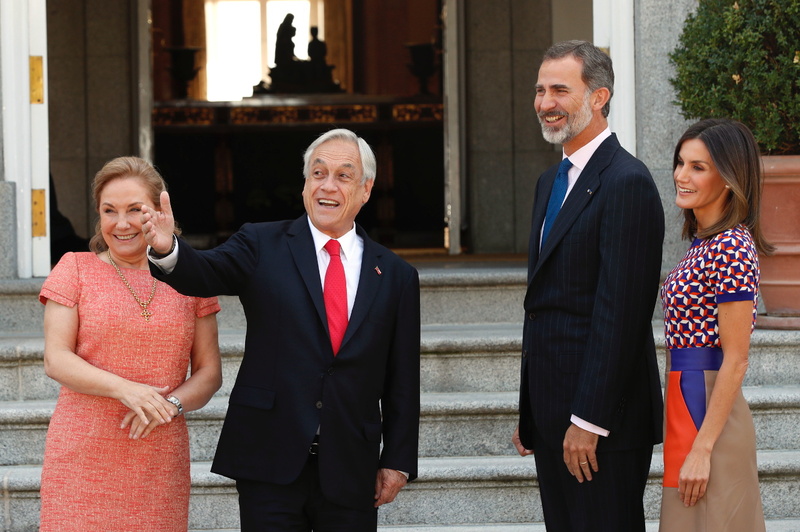 Later in the day, King Felipe and Queen Letizia received the President of Chile Mr. Sebastian Pinera Echenique and First Lady Cecilia Morel Montes at the Zarzuela Palace. 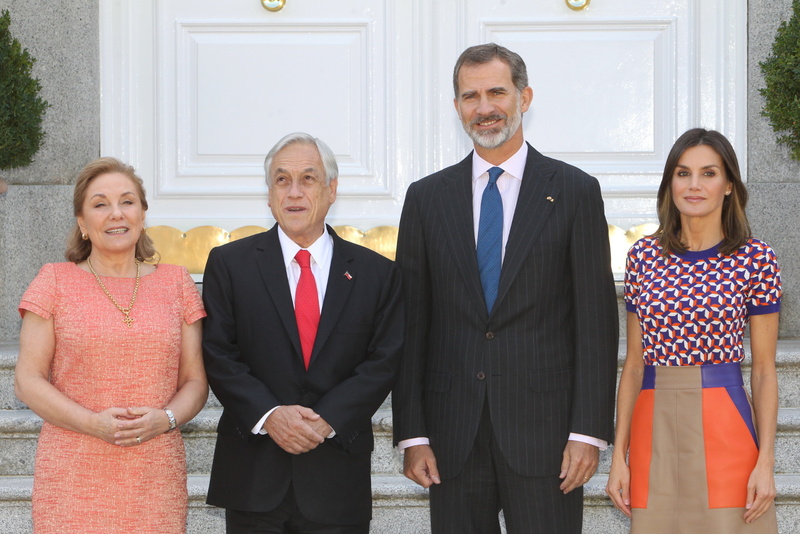 The visit is a part of Chile President’s first international tour. 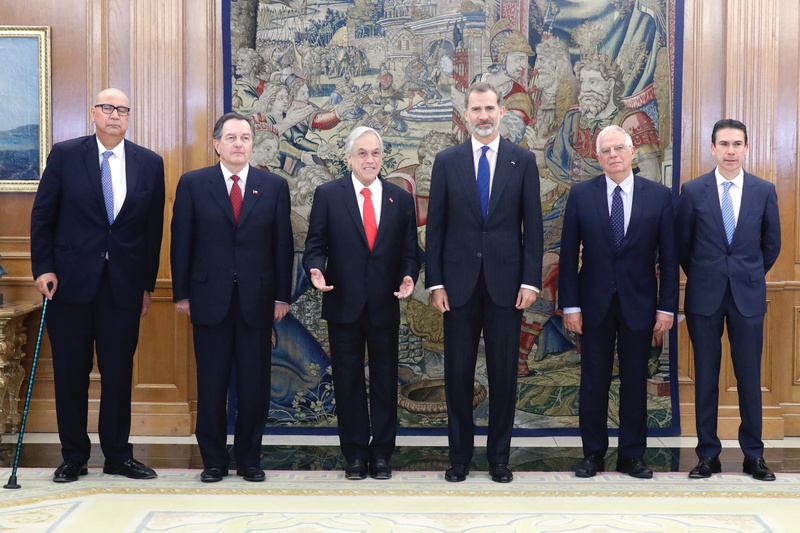 King Felipe and Mr. Pinera held a meeting at the palace. 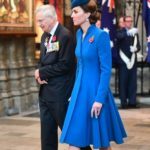 The royal couple hosted a lunch at the palace in the honour of President and First Lady. 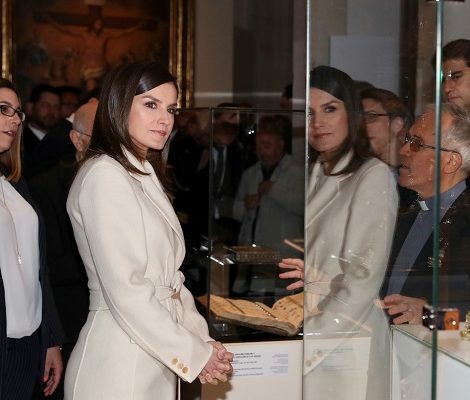 Coming to the sartorial details, Queen Letizia brought back a camel coloured long coat from Felipe Varela back. 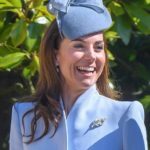 The coat features wide lapel collars and was suitable for the autumn weather. 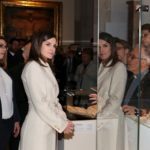 Underneath the coat, Letizia brought back the look that she debited in May this year at the Social Project Gala. 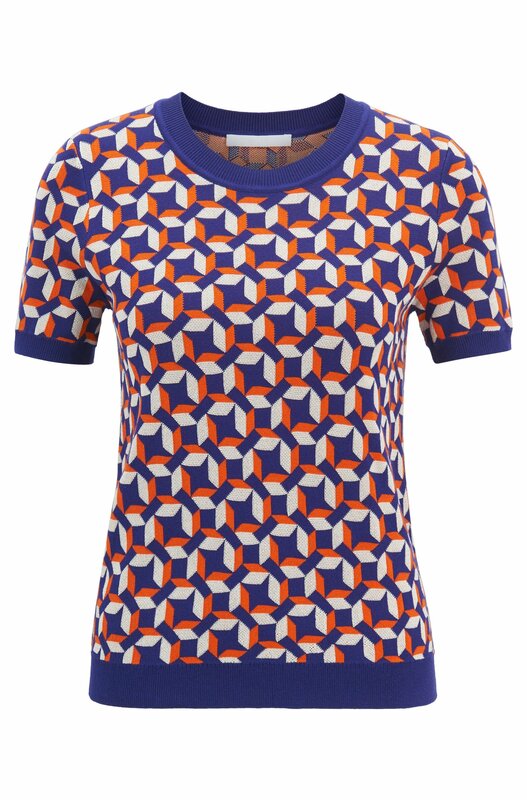 She wore Hugo Boss Short-sleeved ‘Felisabeth‘ sweater with multicoloured pattern. And the sweater was paired with the colour-block leather midi skirt is BOSS ‘Seplea’ Colorblock Leather A-Line Skirt. 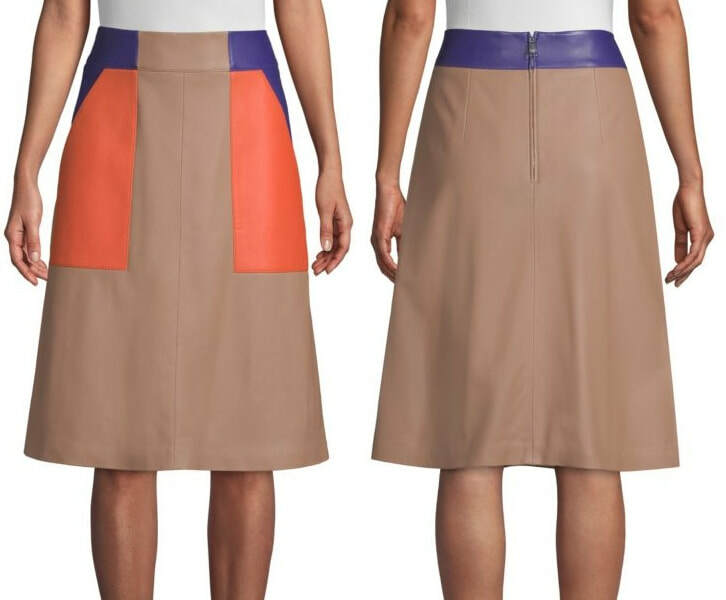 The skirt is currently retailing at Saks Fifth Avenue and Nordstrom for $695. She was wearing Magrit Cognac Leather Laura salons with striped closing that she debuted last week with Carolina Herrera tailored suit. 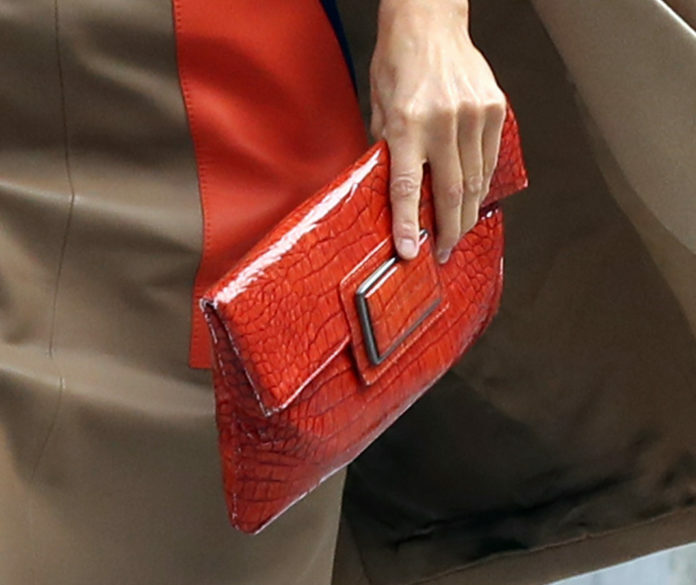 Queen Letizia is carrying Angel Schlesser Croc- embossed orange handbag and finished her look with Crawler Skyline Earrings from Gold & Roses that she debuted in September when she opened the School Academic year. 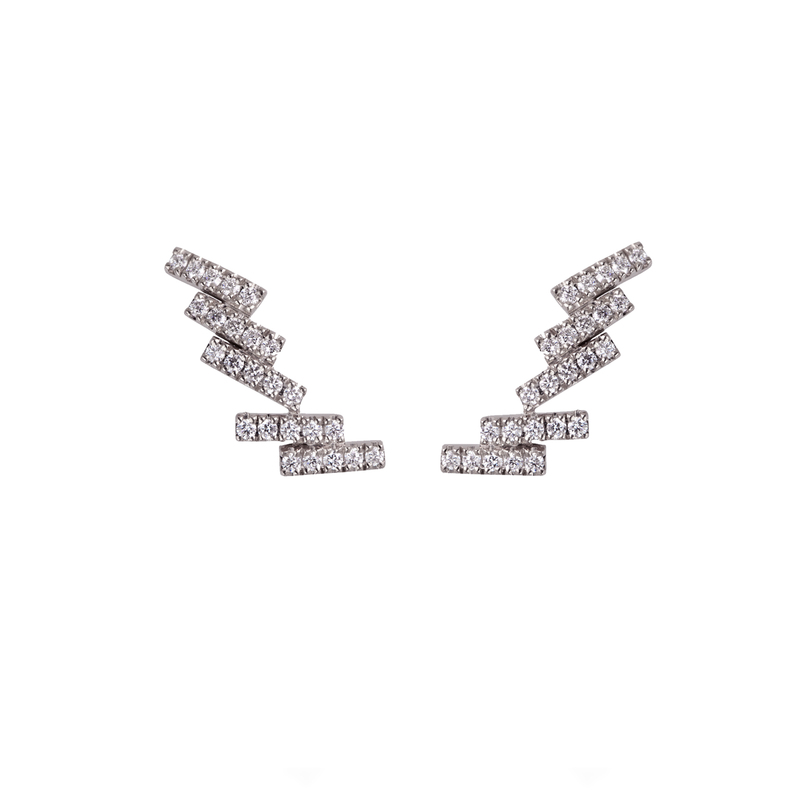 Inspired by the New York skyline – a cosmopolitan collection full of luxury and elegance, the €2107 earrings are set in 18kt white gold and diamonds.